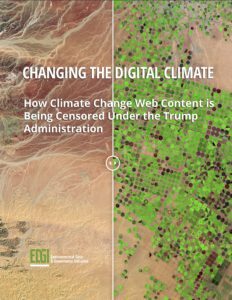 On January 10, 2018 the Environmental Data & Governance Initiative (EDGI) will release Changing the Digital Climate: How Climate Change Web Content is Being Censored Under the Trump Administration, the third installment of EDGI’s series of reports evaluating the environmental impacts of the first year of the Trump administration. Changing the Digital Climate draws on the growing library of reports produced by EDGI’s website monitoring working group, which monitors changes to tens of thousands of federal webpages relating to environment, climate, and energy. We describe trends in the treatment of climate change across federal websites, including a clear pattern of censorship of climate change information and resources. While there is no evidence that any climate data have been removed, we document significant language shifts and loss of public access to information. Removal of information and key documents downplaying US involvement in international climate change efforts. Widespread shifts deemphasizing renewable fuels as replacements for fossil fuels, and prioritization of job creation and economic growth. Removal or significant de-emphasis of climate change information from many agencies’ websites, most notably the EPA. Make it harder for the public to access the results of years of scientific and policy research funded by their tax dollars. Diminish our democratic institutions, such as notice-and-comment rulemaking, which depend on an informed public. Can confuse the public if significant changes are not sufficiently justified. Contribute to broader climate denialist efforts that obscure and cast doubt on the scientific consensus on climate change, hampering critically-important efforts to mitigate and adapt to climate change. The Environmental Data and Governance Initiative (EDGI) is an international network of academics and nonprofits addressing potential threats to federal environmental and energy policy, and to the scientific research infrastructure built to investigate, inform, and enforce them. EDGI documents, contextualizes, and analyzes current changes to environmental data and governance practices through multidisciplinary and cross-professional collaborative work. EDGI fosters the stewardship and expansion of public knowledge through building participatory civic technologies and infrastructures to make data and decision-making more accessible. EDGI creates new communities of practice to enable government and industry accountability.